Millennials are the current generation in the workforce representing 40 percent of the population in the US. Although there are not strict cut-offs, millennials are typically those born between around 1980 and 2000. They are the generational demographic that followed Generation X (which followed the baby boomers) and comes before Generation Z. The millennial stamp is on everything around us: fashion, film, food, and also workplace design. So, what does workplace design for millennials consist of? 1. Open space, but not too open. Generation X favored everything totally open, but millennials came to realize that some privacy is necessary. So, while some workplaces still often favor open bullpens, there is or should be some slightly better separation than there used to be. Common areas may have lots of places to congregate and have informal meetings or discussions, but there are also some individual chairs in corners for those needing some quiet. Millennials are more mindful of the environment than the previous generation. Millennials know that plants create a warm and inviting atmosphere and help add oxygen to a room. Plant walls are not uncommon in a millennial office. Recycling is important to millennials. So, bins for separating waste are no longer for just the tree huggers at home. Office kitchens have those bins too. A millennial office typically has plenty of room to park your bike and may offer employees passes for public transportation. Because why pollute more than necessary? Millennial office furniture is practical. Maybe it’s modular and can be shifted around into different configurations as it’s passed between employees. Or maybe it’s just made of recycled materials because no one wants to waste money on pretty but impractical or nonfunctional items. 3. Employee physical and mental health matters to management. Employers may offer health club memberships as a perk or even have a gym in the office. These managers take their employees on field trips outside the office to improve teamwork and social skills. 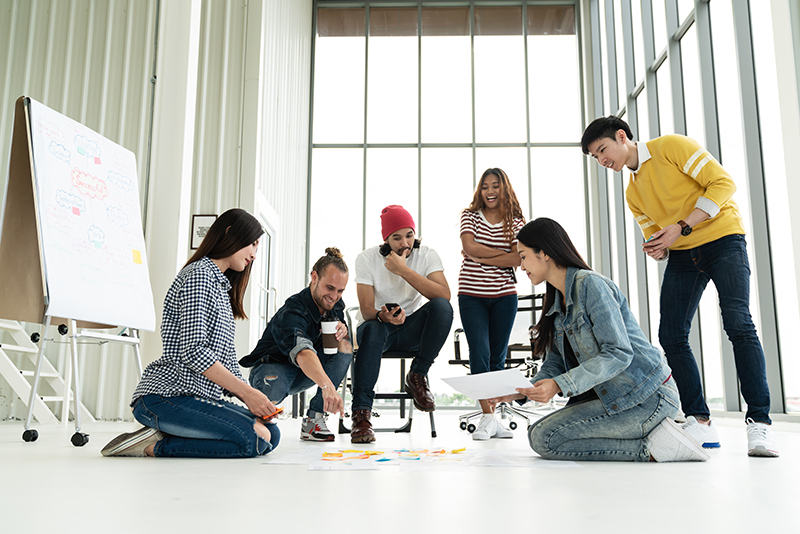 The impact of millennials in business should not be underestimated. In Part 2, we’ll talk about the influence of millennials on tech and on flooring. Do you have other questions? We have been providing sales and installation of commercial flooring products to the following market segments for over 35 years: Corporate, Education, Hospitality, Government and the commercial real estate community. It’s easy to contact us, and we’re happy to help. You can always call us at (301) 762-2000 or email us at sales@eaglemat.net for more information.